We provide the highest quality medical aesthetic services in a comfortable, relaxing environment. We will accomplish this for you by creating individualized treatment plans, emphasizing a personal doctor-client relationship. We use the most advanced treatment options to maximize results, while assuring that our clients’ safety, comfort, and confidentiality remain a priority. Our providers live and work in the Fox Cities — they are available when you need them. 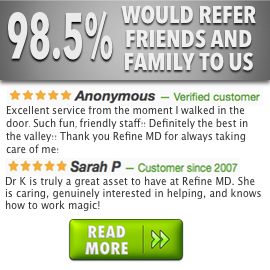 What Makes Refine MD Unique? Your experience begins with a complimentary consultation to create a customized treatment plan just for you. Then, our team of experienced medical professionals, including doctors and medical aestheticians, carries that plan forward, working with you to attain your goals and improve your health and your well being and happiness. To learn how we can help you, stop by our offices, or contact us by phone or email, to schedule a consultation today. We look forward serving you and helping you meet your health and aesthetic goals.